Fasten your garter belt and come up to the lab and see what's on the slab! The ultimate 1975 camp classic returns to the Lincoln for our annual Halloween show in glorious digital cinema projection and 7.1 surround sound. 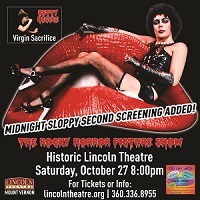 For 42 years, The Rocky Horror Picture Show has delighted audiences and terrified parents. You all know the story -- a loving couple, a few lost monsters and a sweet transvestite from transsexual Transylvania sing and dance through a sloppy salute to horror movies and sexual liberation. Bring your sense of humor.... and some toast (unbuttered of course). The night will be opened by Bellingham's Iconic Drag Queen Miss Betty Desire as she "Sacrifices the Virgins" in her own inimitable way. If you've seen this before you know how much fun it is. Bring a virgin of your own to sacrifice. Rocky Horror prop bags full of goodies will be available for only $5 (courtesy of our friends at Tri-Dee Arts) and include everything you'll need to participate....except the aforementioned toast. B.Y.O.T. Our Art Bar will open one hour before the show. Advance tickets are $12, with $10 tickets for Lincoln members and groups of 10 or more, plus applicable fees!